The Xiaomi Redmi Note 7 went on sale yesterday in China. The phone is launched with a 48MP rear camera and is priced at Yuan 999 (Rs 10,000 appx). We are comparing the smartphone with the Xiaomi Redmi Note 6 Pro to see what’s new company has to offer with its latest device? The Xiaomi Redmi Note(₹ 11999 at flipkart) 7 has created a lot of buzz on the internet before its launch in China. The phone has finally gone on sale for the very first time in China yesterday. The company backed the device with a Qualcomm Snapdragon 660 processor and it is also the first device by the company that has a 48MP unit at the back. On the other hand, the Xiaomi Redmi Note 6 Pro is the first smartphone by the Chinese company that has a dual camera setup at both front and back. Let’s see how these two devices differ from each other in terms of hardware? 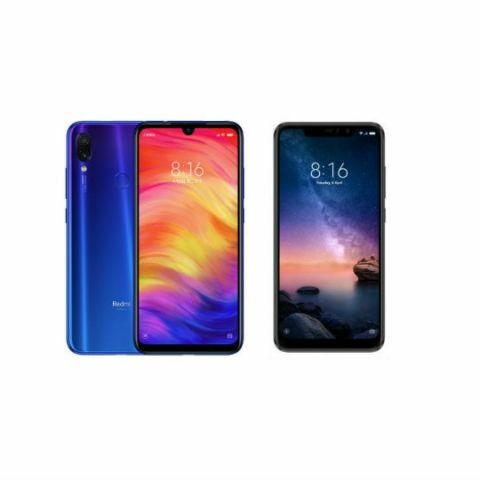 The Xiaomi Redmi Note 7(₹ 11999 at flipkart) comes with a 6.3-inch FHD+ display that offers a resolution of 1080 x 2340 pixels. The Xiaomi Redmi Note 6 has a slightly smaller 6.26-inch screen that offers a resolution of 2280 x 1080 pixels. The difference between the two is very minor in terms of display. 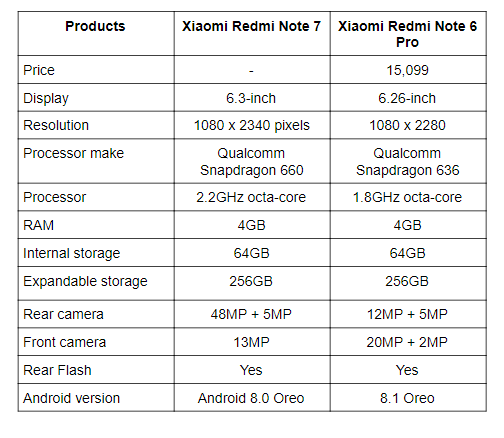 However, on paper, the Xiaomi Redmi Note 7 looks better than the Redmi Note 6 Pro. When it comes to the processor, the Xiaomi Redmi Note 7 is powered by a Qualcomm Snapdragon 660 processor, which is faster than the Qualcomm Snapdragon 636 chipset in the Xiaomi Redmi Note 6 Pro. Both the smartphones pack 4GB RAM and 64GB internal memory, which is expandable to up to 256GB via a microSD card. Coming to the cameras, one of the main highlights of the Xiaomi Redmi Note 7 is its 48MP camera at the back, which is coupled with a 5MP depth sensor. On the front, the company has equipped the device with a 13MP unit for clicking selfies. On the other side, the Xiaomi Redmi Note 6 Pro attraction point is also its dual camera setup at both front and back. The device has a dual 20MP + 2MP front camera along with a dual 12MP + 5MP rear camera. The Xiaomi Redmi Note 7 has finally launched in China. The phone is supposed to come to India very soon. However, there is no official confirmation about the device India launch came from the company yet. On the other hand, the Xiaomi Redmi Note 6 Pro is available on Amazon for Rs 15,299.